Put Your Best Smile Forward This Wedding Season! Your wedding is right around the corner. You’ve been dreaming of it, planning for it, preparing for it. From the dress to your hair to your smile, it’s important to look perfect. And for you, part of looking perfect may mean checking out a cosmetic dentist in Concord for some teeth whitening. After all, many of the photos of you and your spouse will be up close and personal. Short of putting your face on a billboard, there will be few occasions where your face and your smile will get the kind of scrutiny. If you’re considering having this procedure done before your big day, here are some things to think about. If you love, love, love foods like soy sauce and blueberries and drinks like coffee and red wine, the Martha Stewart website suggests that you avoid these items for the time being. Foods and drinks like these count among the chief stainers of the teeth. If you really feel you must have at least some of these items – who wants to give up their morning latte after all – at least drink them through a straw. While the thought of drinking wine through a straw is apt to make you laugh, this is a legitimate way to keep at least some of these staining drinks away from your teeth, according to the Colgate website. 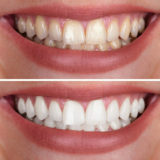 Teeth whitening procedures can be done in-office or at home. According to WedMD, having it done in the dental office is much faster than an at-home kit. You can usually count on having to go in one to three times for the best results. Each visit will last a half an hour to an hour. The visits can be a little spendy, ranging from $500 on up to a $1000. However, if you have the budget, visiting a cosmetic dentist in Concord can keep your wedding on track time-wise. Your dentist will be able to tell you how many visits you should have. You may also want to ask about having a procedure done during the week of your wedding. 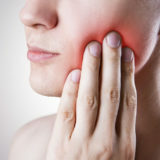 You don’t want the day before; your teeth may be sensitive. However, getting this done the week of may be in the cards. And you can keep your teeth white by following the advice in the previous paragraph. There are a few at-home whitening kits on the market. Aside from whitening toothpaste, there are also tooth-whitening kits with trays that have a peroxide mixture – from 3% to 20%. Teeth may become sensitive using these products. Chatting with your dentist about at-home options might be helpful. That said, whatever disadvantages you might encounter convenience is a huge benefit for this method. You can whiten your teeth at home anytime you want with this method. Your ability to put your best smile forward on your wedding day is dependent upon preparation and know-how. The preparation lies in you limiting your consumption of the foods and drinks that stain the teeth (at least in the days leading up to the wedding). The know-how is finding the right method for whitening your teeth. If you’re not sure which would work best for your situation, you can always talk with your cosmetic dentist in Concord to weigh your options.